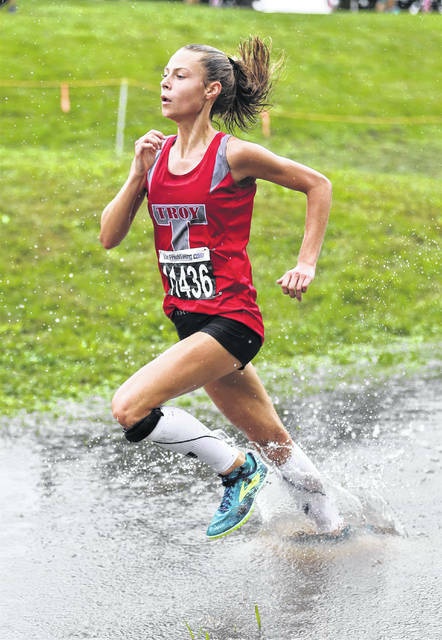 Lee Woolery|Troy Daily News Troy’s Emma Kennett runs through the rain on the way to a second-place finish at the Troy Invitational Saturday. Lee Woolery|Troy Daily News Troy’s Braden Coate competes at the Troy Invitational Saturday. 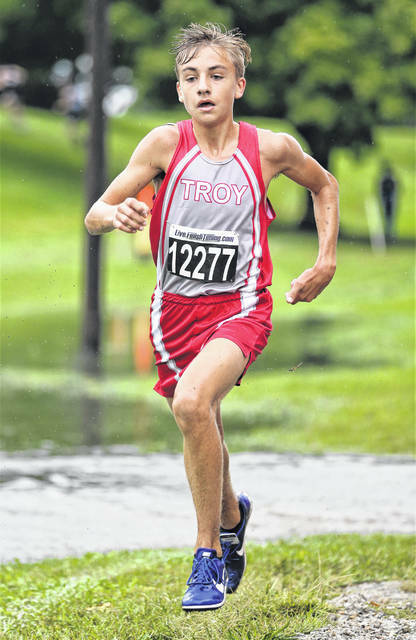 Lee Woolery|Troy Daily News Troy’s Josh Lovitt runs at the Troy Invitational Saturday. 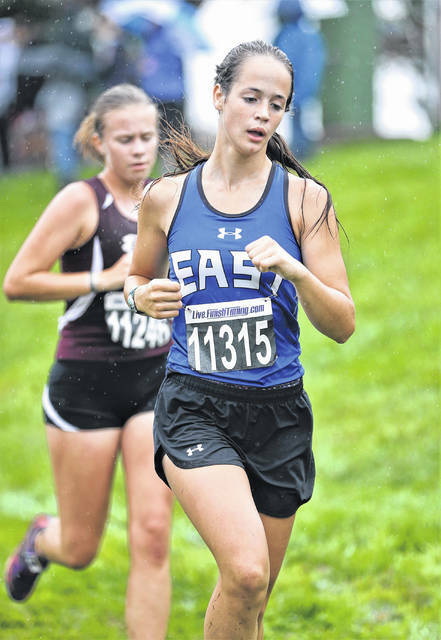 Lee Woolery|Troy Daily News Miami East’s Kiley Davie runs at the Troy Invitational Saturday. Lee Woolery|Troy Daily News Troy’s Renee Kovacs runs at the Troy Invitational Saturday. Lee Woolery|Troy Daily News Troy’s Will Schaefer runs at the Troy Invitational Saturday. 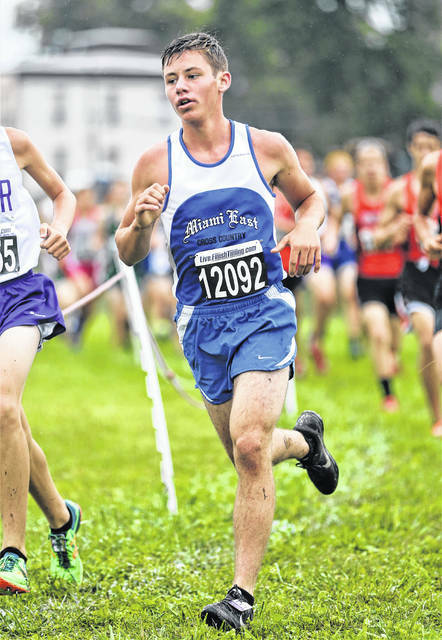 Lee Woolery|Troy Daily News Miami East’s Alex Hayes runs at the Troy Invitational Saturday. Lee Woolery|Troy Daily News Miami East’s Marisa Savini competes at the Troy Invitational Saturday. 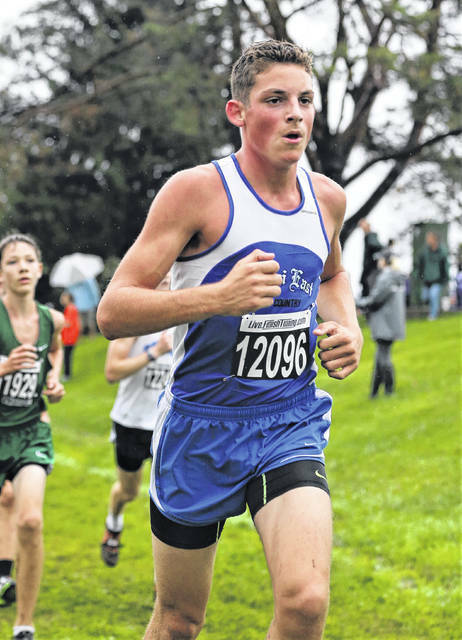 Lee Woolery|Troy Daily News Miami East’s Cam Richter runs at the Troy Invitational Saturday. 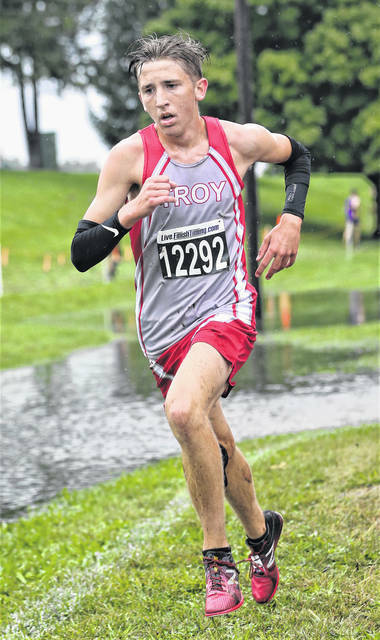 Lee Woolery|Troy Daily News Troy’s Austin Zonner runs through a large puddle during the Troy Invitational Saturday. TROY — Troy freshman Emma Kennett has become accustomed to running against tough competition already. Saturday, in the rain and mud and muck on Troy’s levee, she showed what she can do against regional-level competition. Kennett was the individual runner-up and the Trojan girls were fourth as a team at Saturday’s Troy Invitational — which over the years has become a preview of the regional meet. And on the boys side, freshman Braden Coate led the Troy boys to an eighth-place finish by cracking the top 20 individually. As a team, Troy’s girls were fourth with 164 points. Lebanon won with 46, Beavercreek was second with 66 and Talawanda was third with 88. And Kennett was ready for what she faced on the day. Kennett was second in 19:38.2, with Lebanon’s Hope Erbach winning in 19:03.3 and Beavercreek’s Juliann Williams third in 19:53. In addition to being a regional preview, with hopeful teams coming from all over to get a look at the course, the Troy Invitational also typically takes place during ACT testing, meaning Troy’s seniors are unable to run. Renee Kovacs was 25th (22:00.6), Ella Kirkpatrick was 52nd (23:19.9), Katie Lord was 60th (23:33.8) and Hannah Falknor was 67th (23:47.4). “The starting line was a little confusing,” Kennett said. “We had no idea which boxes we were supposed to be in … but we figured it out. It was also important for Kennett to run well on the levee, according to Alexander. Miami East’s girls was 11th with 313 points. Kiley Davie was 23rd (21:57.5), Marisa Savini was 35th (22:29.6), Paige Blauvelt was 109th (25:09.7), Elizabeth Bennett was 157th (27:29.4) and Cyrene McAdams was 200th (30:09.9). Newton was 13th with 346. Kendra Kern was 54th (23:22.5), Baily Chaney was 73rd (23:55.1), Faith Williams was 111th (25:12.8), Kara Chaney was 146th (26:52.9) and Mackenzie Knupp was 171st (27:59.3). On the boys side, Troy was eighth with 234 points. Coate led the way in 18th (17:43.3), Josh Lovitt was 28th (18:04.9), Austin Zonner was 39th (18:23.4), Will Schaefer was 65th (18:49.2) and Keegan Potts was 96th (19:22.7). The Trojans have a team goal this year, too — to reach the regional as a group. And they were happy with how they performed against that level of competition. Miami East was 16th with 459 points. Alex Hayes was 64th (18:49.1), Cam Richter was 68th (18:51.4), Michael Bair was 116th (20:00.7), Garrett LeMaster was 120th (20:12.1) and Adam Bensman was 141st (20:47). Newton was 17th with 485 points. Curtis Shellenberger was 70th (18:53.8), Owen Via was 90th (19:15.2), Robert Ingle was 106th (19:43.2), Jacob Moore was 127th (20:17.5) and Clint Shellenbarger was 146th (21:09.1). https://www.tdn-net.com/wp-content/uploads/sites/21/2018/09/web1_090818lw_troy_emmakennett.jpgLee Woolery|Troy Daily News Troy’s Emma Kennett runs through the rain on the way to a second-place finish at the Troy Invitational Saturday. https://www.tdn-net.com/wp-content/uploads/sites/21/2018/09/web1_090818lw_troy_bradencoate.jpgLee Woolery|Troy Daily News Troy’s Braden Coate competes at the Troy Invitational Saturday. https://www.tdn-net.com/wp-content/uploads/sites/21/2018/09/web1_090818lw_troy_joshlovitt.jpgLee Woolery|Troy Daily News Troy’s Josh Lovitt runs at the Troy Invitational Saturday. 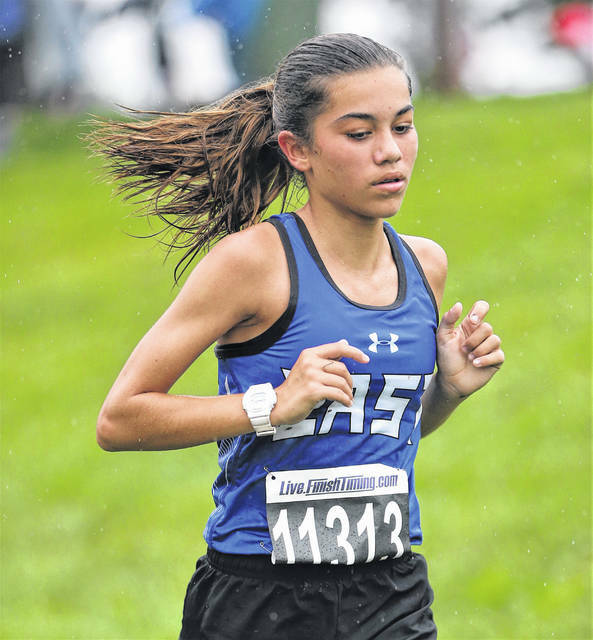 https://www.tdn-net.com/wp-content/uploads/sites/21/2018/09/web1_090818lw_me_kileydavie.jpgLee Woolery|Troy Daily News Miami East’s Kiley Davie runs at the Troy Invitational Saturday. 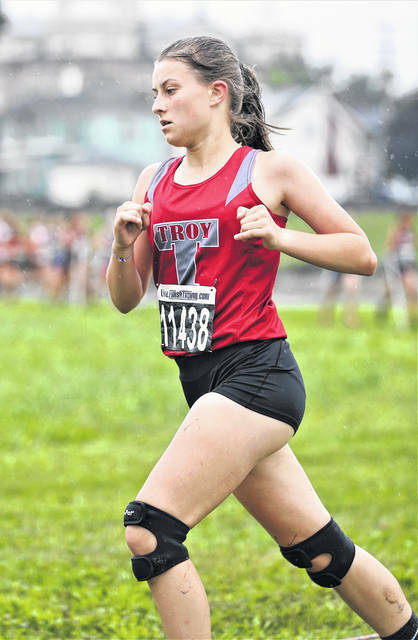 https://www.tdn-net.com/wp-content/uploads/sites/21/2018/09/web1_090818lw_troy_reneekovacs.jpgLee Woolery|Troy Daily News Troy’s Renee Kovacs runs at the Troy Invitational Saturday. 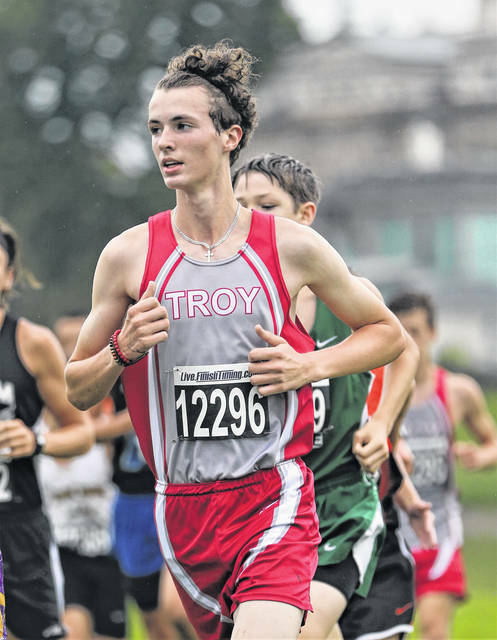 https://www.tdn-net.com/wp-content/uploads/sites/21/2018/09/web1_090818lw_troy_willschaeffer.jpgLee Woolery|Troy Daily News Troy’s Will Schaefer runs at the Troy Invitational Saturday. https://www.tdn-net.com/wp-content/uploads/sites/21/2018/09/web1_090818lw_me_alexhayes.jpgLee Woolery|Troy Daily News Miami East’s Alex Hayes runs at the Troy Invitational Saturday. https://www.tdn-net.com/wp-content/uploads/sites/21/2018/09/web1_090818lw_me_marisasavini.jpgLee Woolery|Troy Daily News Miami East’s Marisa Savini competes at the Troy Invitational Saturday. https://www.tdn-net.com/wp-content/uploads/sites/21/2018/09/web1_090818lw_me_camrichter.jpgLee Woolery|Troy Daily News Miami East’s Cam Richter runs at the Troy Invitational Saturday. 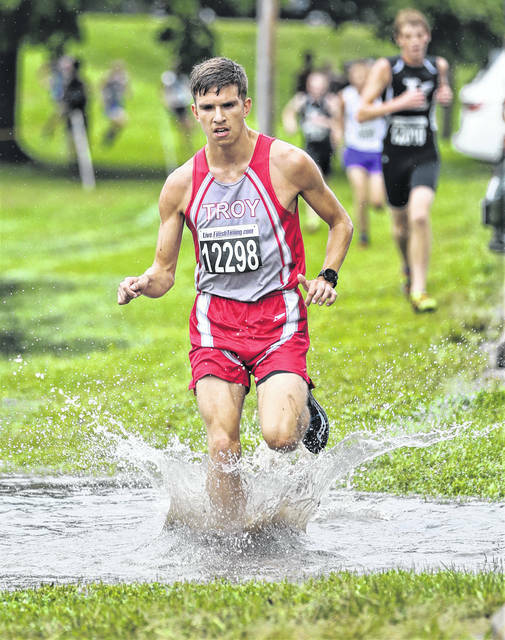 https://www.tdn-net.com/wp-content/uploads/sites/21/2018/09/web1_090818lw_troy_austinzonner.jpgLee Woolery|Troy Daily News Troy’s Austin Zonner runs through a large puddle during the Troy Invitational Saturday.